Once they have been matched betting for a couple of months, we always recommend that our members start to take advantage of bookmaker promotions on multis. Multi promos are great for a couple of reasons. The first is simple – they offer loads of value and can provide an extra profit stream on top of all the other promos. The second is that they are less likely to trigger the bookies ‘Matched Betting’ alarms. Multis are generally a mugs bet. Compounding of already poor odds makes them hugely profitable for the bookies, so they love it when people bet on them. As a result, taking advantage of multi promos is less obvious than other forms of matched betting. There are a few different ways to approach multis depending on how risk-averse you are, and how much time you want to spend placing your bets. The first option is the No Lay approach. This is the easiest option as it only requires one bet. It should also be the most profitable over the long-term due to the fact that there are no lay bets, and therefore no Betfair commission. However, in the short-term you might have to deal with long and expensive losing streaks. It’s not for the fainthearted, or those with a small bankroll. Option number two is to Sequentially Lay each leg. This is the opposite of No Lay. It has very little risk, but it requires some work, and a lot of the value will be eaten up by Betfair commission. Some people like to combine both of these options to find some middle-ground. 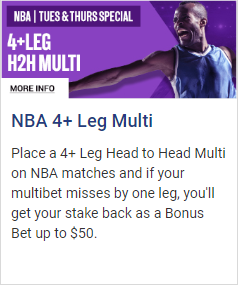 This can be done by no-laying , or under-laying, the first couple of legs of a multi and the using our multi promo calculator to lock-in some profit on the later legs. This method involves backing the multi, and then laying each selection as though it were an individual bet. By doing this we can increase the number of possible scenarios in which we can make a profit, while also limiting our downside. The hardest part of using the Lay at the Start approach is working out whether or not a particular multi is worth doing (i.e. whether it has a +EV), but that is no longer an issue thanks to our new Lay at the Start Multi-Matcher. Using data from our ATM OddsMatcher software, the Multi-Matcher can automatically identify the highest EV multi for any given bookie and sport. It then calculates the lay stakes that you should use at Betfair. The Multi-Matcher also shows you what your profit or loss would be for each of the different possible permutations of the multi. Due to compounding of the odds, you will always make a profit from this approach if all of the teams in your multi win. However, you will make even more money if all of the teams lose! This is because you would have 4 winning bets at Betfair, but only one losing one at the bookie. The worst result when using this approach is if exactly one team loses but, even then, we do not lose our full stake. The Lay at the Start approach to multis is ideal for those who are not completely risk-averse, but don’t want the huge swings of the No Lay approach. By using the new Lay at the Start Multi-Matcher you can easily take advantage of this approach. It will find you the best multi, work out your lay stakes, and calculate all of the potential outcomes. It is just one more tool that helps bonusbank members maximise their matched betting profits.